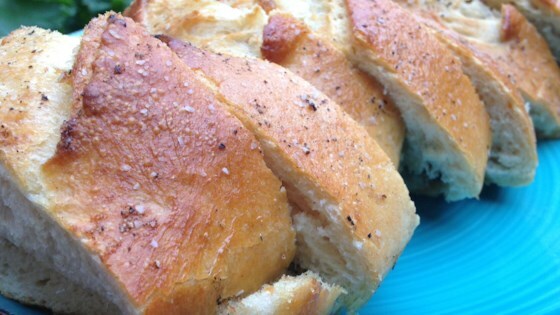 "This is the perfect summertime bread. The grill gives it such delish flavor. We make this to accompany steaks as well as grilled chicken and salads. It's super tasty and very easy. I have to make 2 loaves because it's a favorite. I have toyed with the recipe and added all kinds of spice, but found that good old salt and pepper has the best flavor; go figure! Don't worry about excess butter coating the bread; when the hot loaf comes off the grill, the butter will melt in. We only eat wheat bread, but white would taste just fine." Slice loaf lengthwise without cutting completely through the bread. Spread half of the butter on inside surfaces; season with salt and pepper. Coat the outside of the bread with remaining butter; season with salt and pepper. Place loaf cut-side down on the grill; toast until browned, checking often, 3 to 5 minutes. Close loaf using tongs. Grill surface until crispy, checking often, 3 to 5 minutes per side. Transfer loaf to a cutting board using tongs; slice into 10 diagonal slices. See how to make summer’s ideal side dish starring zucchini and yellow squash.